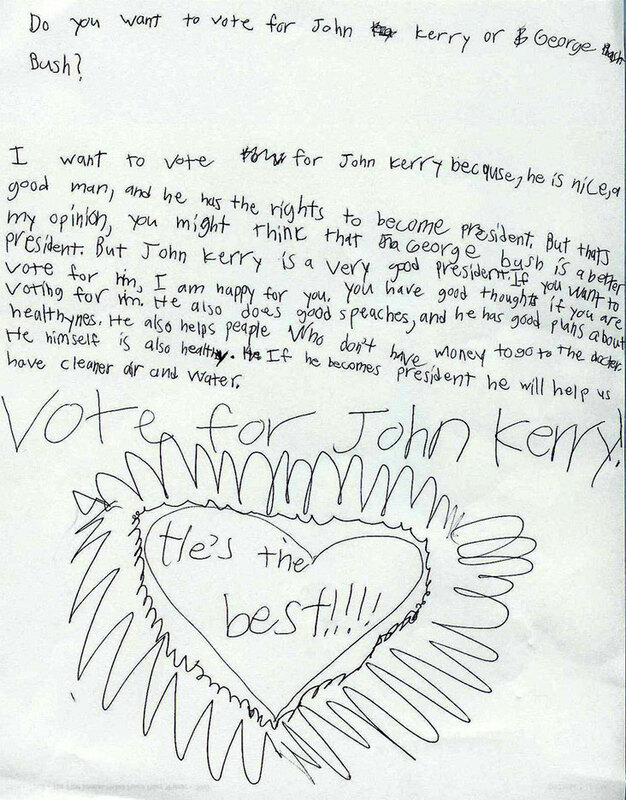 My 7-year-old niece Mitchka volunteered to speak on behalf of John Kerry at school. She wrote the following speech and read it to her classmates. Although George Bush was the final winner after the kids voted (20 to 8), I am so proud of her courage to stand up for what she believes, specially since she lives in a mostly Republican neighborhood! I want to vote for John Kerry because he is nice, a good man, and he has the rights to become President. But that's my opinion, you might think that George Bush is a better President. But John Kerry is a very good President. If you want to vote for him, I am very happy for you. You have good thoughts if you are voting for him. He also does good speeches, and he has good plans about healthines. He also helps people who don't have money to go to the doctor. He himself is also healthy. If he becomes President he will help us have cleaner air and water. Vote for John Kerry! He's the best!!!! The Board and the Scholarship Committee of the Iranian-American Bar Association (IABA) invites applications for its annual scholarship. IABA is a non-profit organization dedicated to protecting and furthering the interest, and promoting the advancement of the Iranian-American Community at large and the community of Iranian-American attorneys in particular. These scholarships will be the first awards to recognize law students committed to the advancement of the Iranian-American community, and we hope that they will become the beginning of a tradition to continue for many years. As such, we would greatly appreciate your assistance in disseminating information on this program to law students at your school. -- Applicant Statement: A statement or essay written by the applicant (no more than one single-sided 1.5 spaced typewritten page) articulating: how the applicant believes he/she will make a difference as an attorney on issues of concern and interest to the Iranian-American community and in advancing IABA's mission, and/or what influenced the applicant to study law, and why the applicant would like to be an attorney. -- Official Law School and College Transcripts. Please note that all applications must be post marked by December 30, 2004 and applications must be submitted to: The Iranian American Bar Association, 1025 Connecticut Ave. N.W. Suite 1012, Washington, D.C. 20036. If you have you any questions, please feel free to email us at iaba@iaba.us. Thank you for your time and attention. Back to my teeth, I brush them barely once a day. There are days I don't brush at all. Despite my careless attitude towards such an important part of my body, my teeth are still in good shape. Except for my wisdom teeth, three of which have been disposed of, the rest are all in the right place and order (never needed braces). And they are durable too. Considering the crappy way I treat them, at 42, I've only had one cavity -- which I ignored so long I needed a root canal to dry up the infectious goo that had crept up my skull. Oh, and I smoke too. So my teeth have become too yellow, some may even say orangish. Although I've been aware of this disaster for a couple of years now, I've put off doing anything about it because I know I can't afford going to a dentist. My own close family members, who are top dentists, have already been very kind in taking care of my teeth for free when I badly needed it. So I wouldn't dare ask them to sand blast 40 years of neglect -- just because. So I slipped an email to Zohreh Khazai Ghahremani, who has been writing some of the very best articles in iranian.com. She's a dentist. I asked her for advice. Zohreh said I did not need to go to a dentist at all. She recommended Crest's White Strips Premium. I was skeptical. But I thought I'd give it a try. I could spend $27 for the strips and if the results turned out disappointing, I wouldn't mind. Well, I'll be damned. These flimsy colorless strips really really work! 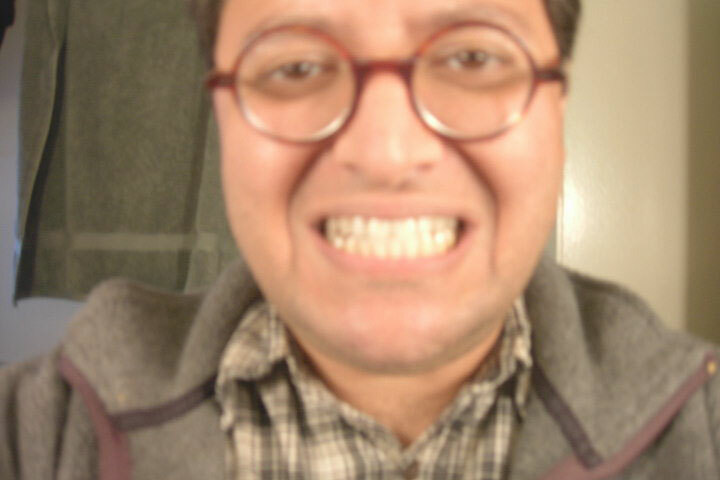 Now before I show you my teeth, I must tell you that I've used the strips for only seven days. I have seven more to go. I should have taken a picture before I started. But I forgot (thank god; they look bad enough now). Ladies and gentlemen, say hello to my teeth. I shall display the final product in another week, if you care to be further grossed out. 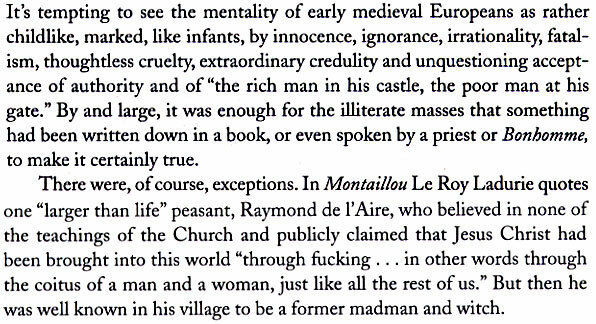 I have to share with you this excerpt from "In Search of Zarathustra" by Paul KriwaczekIt. "Borjom is a charming summer resort, nestled among picturesque mountains and along the banks of the Kura River, whose rapid current pours in swift torrents from the mountain gorges above. Very celebrated mineral springs are located here, the waters of which are shipped to all parts of the empire. Many splendid villas and residences are scattered throughout this romantic region. The palace of His Imperial Highness the Grand Duke Michael is beautifully located on the banks of the river, some distance above the city. 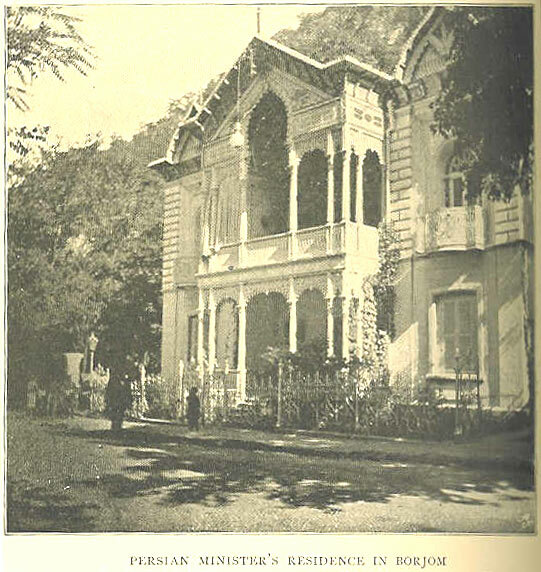 I was especially interested in a most artistic and ornate dwelling occupied by the Persian minister, who resides here." Who am I? Interesting question. I'm a product of a rift in time and destiny. I can speak a number of European languages fluently, not because I want to but because I spent my life drifting across the globe. I can accurately quote Shakespeare, Kant, and Sadegh Hedayat, when the occasion calls for it. I can recite Chaucer's Canterbury Tales, as comfortably as I can recite Ferdowsi. I can read and write in a number of languages. I am as comfortable at La Tour D'Argent in Paris as I am at Sharaf'ol'Eslamy in Tehran's Bazaar. I know my way around St Peter's Basilica in Rome as well as I know my way about Meydooneh Toopkhooneh in central Tehran. I'm as comfortable hunting deer in Arnold's California as I am having Ghelyeh Mahi at a stand by the water in Oman. I can seem at home at a peach orchard in Georgia, or picking pomegranate at an orchard in Saveh. I can swap insults with any Algerian pimp in Bois-de-Boulogne, as comfortably as discussing Sino-American Corporations with a foreign diplomat at an embassy gathering. I'm not sure exactly who I am, but I am certain of what I am: I am human silly-putty, able to mold myself into the mask of the moment. Yet behind the mask there is something constant, immovable, old as the dust on the ruins of Perspolis: the rage thundering inside. Rage at Mother Iran for preparing me better than any school, better than any camp, better than any agency, for betrayal as an occupation. Rage at a society where the most educated physicist will go to "Emamzadeh Saleh" and pray to the rotten relics of a man that may have never been, to better insure that he is accepted to the PhD Program at MIT. Rage at a society whose offspring in the millions are scattered across the globe, each having sworn an oath of allegiance to another country to get a different colored passport, and yet scarce a handful of the millions are willing to really stand by the words they swore to get that passport. You see, no agency could teach me how to lead a double life better than the society that taught me to mix beer and Quran, music and Azaan. So here I am wearing the mask of the moment, and behind the mask there is a steely determination to betray the very society that created a monster like me. I'm coming home Mother Iran, I'm coming home to your arms, to embrace you, and stick the dagger I have carried in my heart, into your back, and lovingly hold you as you draw your last gasps; and sooth the shock in your gaze with the serenity in mine. Recently, a member of Iranica Institute's Program Development Committee was diagnosed with stomach cancer. 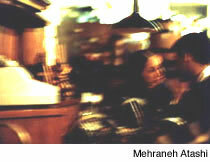 In his quest to find an answer to the origin of his illness, he has concluded to much of his surprise that most Iranians, and for that matter many people from Asia, Africa and South America, who were born and raised in their homelands prior to migrating to the United States have a bacteria in their stomach which in later years may cause ulcer that could possibly lead to stomach cancer. There are many reasons for this, among which are using contaminated or poorly treated water, or consumption of certain foods. For example, many Japanese who eat raw fish known as sushi also have shown to have this bacteria. The Japanese government has made it mandatory for all Japanese citizens to routinely check for this bacteria in their body and seek medical attention. This bacteria generally stays dormant for many years but may become active after the age of forty or so in both men and women. The name of this bacteria is H-Pylori. A simple blood, urine, or breathalyzer test will detect the existence of this bacteria. The treatment is very simple. A cocktail of antibiotics taken over a period of 10 days will cure the illness. As a public health announcement, the Iranian Institute urges you to take up this matter with your doctor during your routine or annual check up. A couple of nights ago I met bright, young, energetic Iranians who are among the pioneers of the Persian weblog movement. They have stopped posting notes on their sites because of the recent crackdown on prominent Internet writers and their relatives in Iran. They didn't want to endanger the lives of their arrested colleagues. When I heard the words being spoken by the afflicted bloggers across the table, my heart sank. I had read about the recent crackdown on Internet writers as well as the trash in Kayhan [also see "Slapping back" and "Let the world know"], but to see the actual victims talking about it -- it's heartbreaking. You look at them and you feel how our youth are wasting away. Our brightest are being forced into silence with the ugliest intimidation tactics and constant extortion. And this is just the beginning. While growing numbers of Iranians discover the Internet and start publishing everything under the turban, the state has refocused its censorship efforts from the traditional (and already gagged) print media, to the Internet. Free voices will continue to flow out of Iran by sheer determination of a courageous few. But the recent arrests will push many Internet self-publishers towards self-censorship or anonymity. There's even talk that the IRI will soon require all bloggers and independent web sites to obtain a permit. Those who refuse will face possible punishment and access to their site will be blocked. Besides seeking the support of free speech groups, we should be looking for technology that would minimize the IRI's ability to limit access to the Internet. Anonymizers have proven to be less than effective.